"Each showroom has its own distinct style and functional elements." The Oscar Hunt showrooms, in both Melbourne and Sydney, are designed to be enjoyed. Yet each showroom has its own distinct style and functional elements. 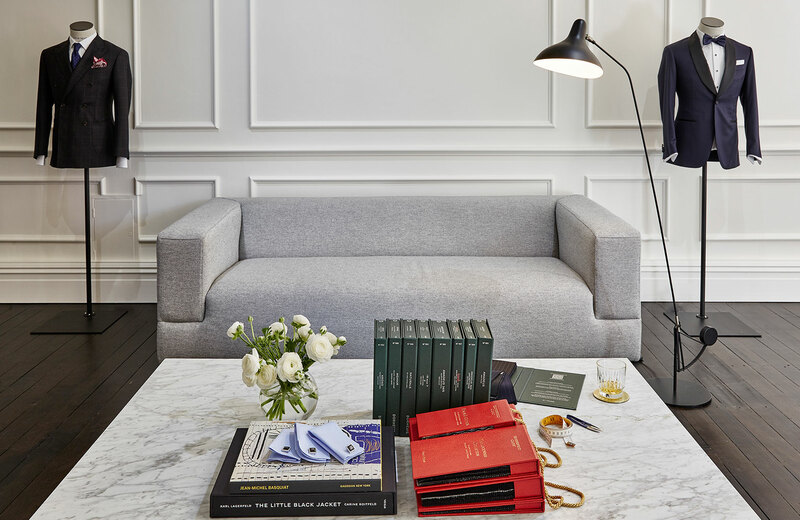 We ask the interior designer, Ally Lucas, to give us her thoughts behind the tailoring spaces. The inspiration for this space largely came from the grand Haussmann-style apartments and terraces of Paris; with high ceilings, original floorboards and ornate wall moldings. We wanted the showroom to be both bold and elegantly masculine, a pared-back space with warmth. White washed walls, a simple palette of black, white and grey with additions of brass and velvet lend well to the balance of classic and contemporary. Infusing a traditional French design ethos with clean modern lines reflects the Oscar Hunt experience – a modern twist to an old world luxury. What are the practical elements? 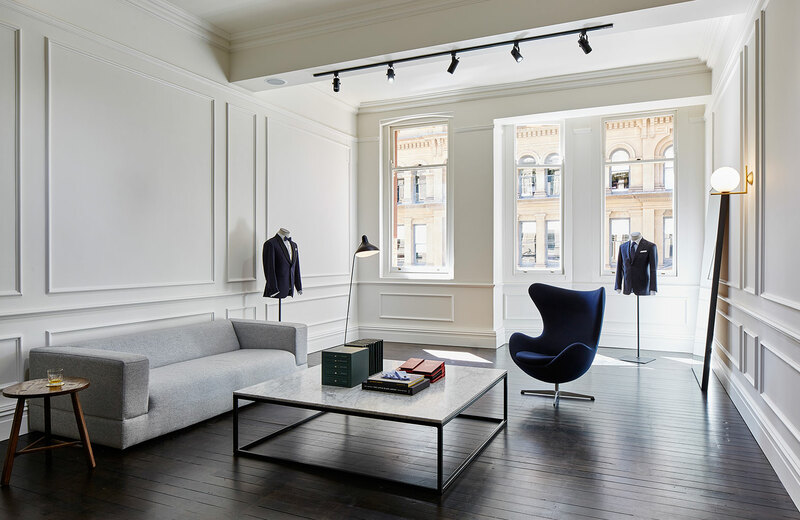 The layout provides a central showroom flanked by two bright fitting rooms, the tailoring room and a moody bar/lounge area. The focus is on light, with floor-to-ceiling French steel doors allowing the natural light to flood into the space. What can people expect when they walk into the Sydney OH showroom? 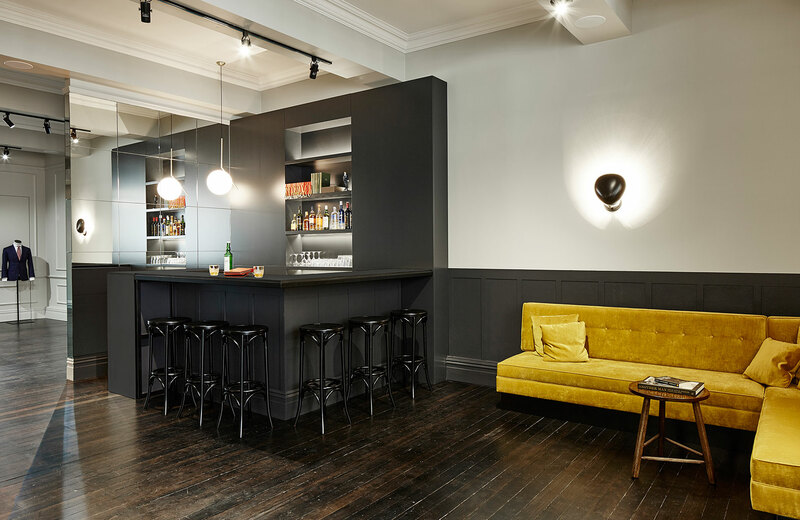 With an emphasis on high quality materials, worldly sophistication and old school charm – you can expect a tactile, warm and remarkable experience at Oscar Hunt Sydney. The furnishings and interiors are a modern take on a yesteryear establishment - the gentleman's club. The colour palette juxtaposes old with new; dark woods and moody charcoals paired with crisp white and polished concrete. The Melbourne showroom exudes a seducing confluence of refined masculinity and charm, edgy urbanity and an undeniable energy. 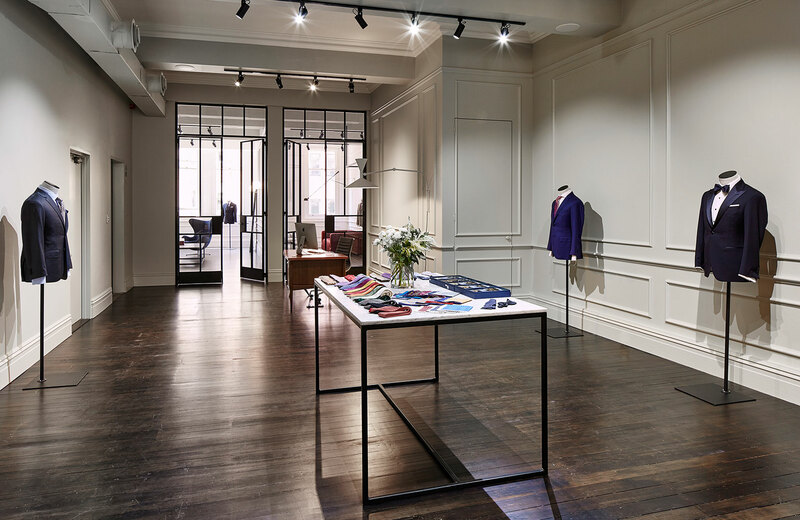 Elements of the showroom, particularly the fitting rooms, give a deliberate nod to the magnificent tailoring houses of Savile Row (without the deer heads, heavy carpet and 200 years of dust). With each of our clients, the process begins with a conversation. Therefore we wanted this showroom to facilitate that conversation. The lounge area is designed for informal discussion – with a ‘home away from home’ style of seating arrangement. Despite being open in the layout of the showroom, with handsome spaces throughout, we have created an air of privacy, with the two fitting rooms, that is important for the client to really feel comfortable and at ease during their fittings. What can people expect when they walk into the Melbourne OH showroom? The Melbourne showroom is a warm and welcoming place, a place where one can really feel at home. Entering the showroom, it is not uncommon to see a gent, sitting calmly in a leather armchair, reading a newspaper and gently swirling his glass of golden whisky.